Dream it and they shall come. That's the premise of the POSSIBLE GREENLAND exhibit at the 13th Annual Architecture Exhibition of the Venice Biennale, headed by the Danish Architecture Centre and curated by Minik Rosing and Nord Architects. This exhibit seeks to explore the huge potential and some of the challenges that face Greenland, a place that has gotten global attention of late due to its natural resources and its position on climate change. 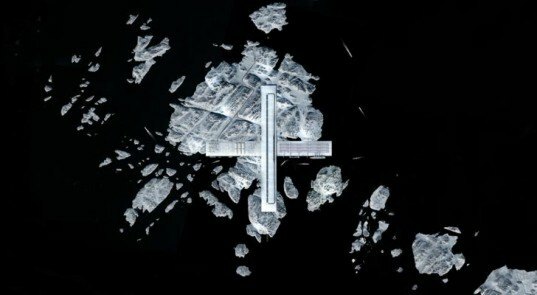 BIG (Bjarke Ingels Group) in collaboration with TENU, Julie Hardenberg and Inuk Silas Hogh created the Connecting Greenland: AIR + PORT portion of the POSSIBLE GREENLAND exhibit. 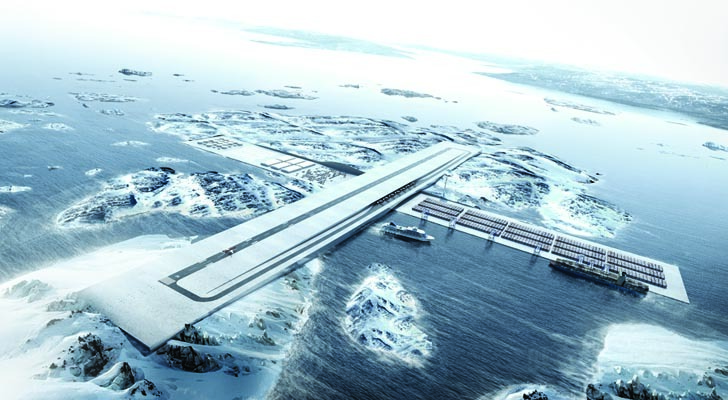 The architects propose creating a multi-modal transportation hub for domestic and international travel just south of Nuuk, the capital. Currently, Greenland residents rely heavily on air travel to get around, but are plagued by empty flights and staggering prices. BIG and its cohorts are proposing to address this domestic problem with a global solution. The Greenland Transport Commission identified the island of Augisunnguaq, south of Nuuk, as a potential new hub for connecting Greenland domestically and internationally by air and by water. But Connecting Greenland: AIR + PORT isn’t just about creating a new piece of transportation infrastructure. It proposes a variety of programs and mixed uses for the area as the genesis of a new paradigm of efficient transportation and vibrant public programs that would benefit the whole country. This holistic solution is what Bjarke Ingels calls Social Infrastructure. This vision is part of Greenland’s attempt to position itself at the center of major world economies like Europe, Asia and America. Instead of positioning itself as a back-water in harsh and inaccessible part of the world, Greenland wants to explore its potential as a transit hub between Europe and America – increasing potential transit tourism while at the same time cutting costs for local commuters. Other parts of the POSSIBLE GREENLAND exhibit include Cultivating Greenland, Inhabiting Greenland and Migrating Greenland, exploring the multiple aspects of the country as a way to work towards a more prosperous and connectedglobal future. The Greenland Transport Commission identified the island of Augisunnguaq, south of Nuuk, as a potential new hub for connecting Greenland domestically and internationally by air and by water. But Connecting Greenland: AIR + PORT isn’t just about creating a new piece of transportation infrastructure. It proposes a variety of programs and mixed uses for the area as the genesis of a new paradigm of efficient transportation and vibrant public programs that would benefit the whole country. This holistic solution is what Bjarke Ingels calls Social Infrastructure. This vision is part of Greenland’s attempt to position itself at the center of major world economies like Europe, Asia and America. Instead of being a back-water, harsh and inaccessible part of the world, Greenland wants to explore it’s potential as a transit hub between Europe and America – increasing potential transit tourism and at the same time, cut costs for the local commuters. The Air + Port proposal was on display at the 13th annual architecture exhibition of the Venice Biannale.